I guess this Ramadan proves that I’m drawn to Mediterranean and North African food as my go-to cuisine for the month. Not sure why, exactly, but it has so many bonuses, so why not? The mixture of sweet and savory, the healthy and light fare offered, the aromatic spices used- yum, yum and more yum. So, yes, please. 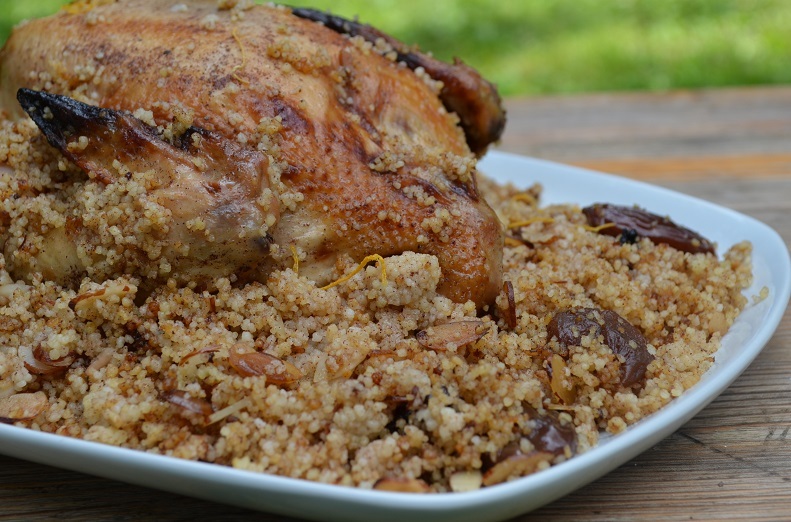 The original recipe (called Djaj M’Ammar Bil Kesksou) calls for stuffing the bird (chicken, pigeon, squab) with the couscous mixture after the bird has been cooking for some time, but it also says you can place it on the side. Stuffing seemed a bit difficult to me because, well, dealing with a very hot bird and a very hot pan, I honestly had trouble maneuvering around to scoop the couscous into the bird’s cavity. 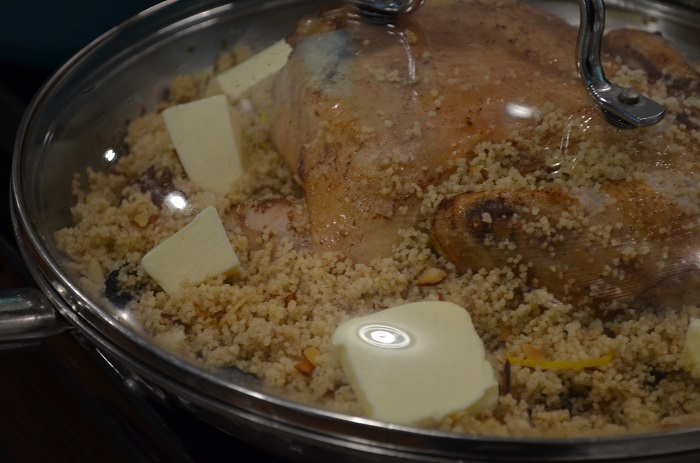 So, I did the next best thing- put the couscous all around the bird and covered the pan while it cooked, hoping it would not burn or dry out the couscous. 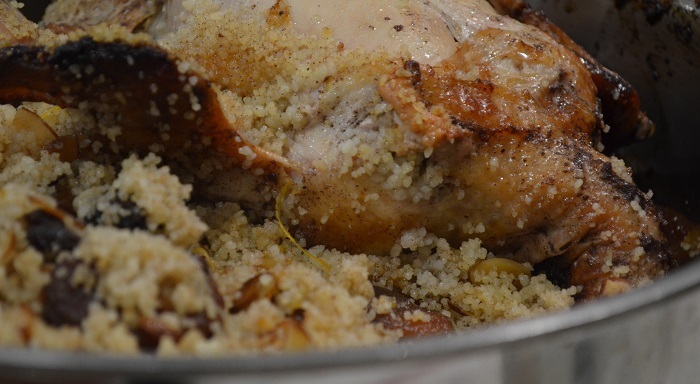 What resulted was a perfectly moist bird and nicely steamed couscous. I’ll be doing it this way again, insha’Allah. So, here’s how it’s all done. 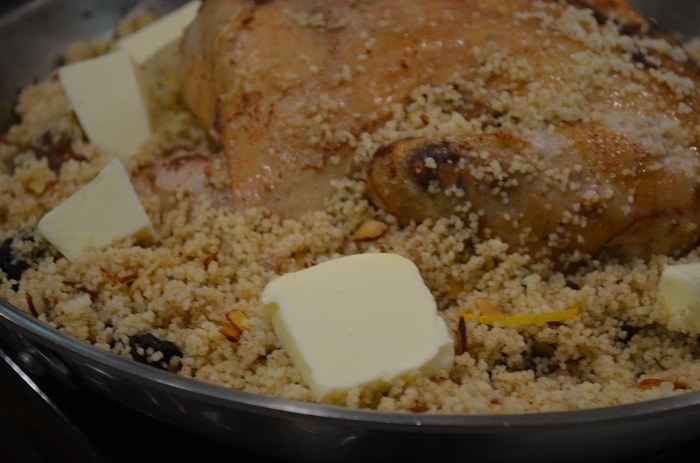 Prepare the chicken first by gathering the spices (ground cinnamon, ground ginger, salt, pepper), oil and honey that it will cook in first before placing the couscous that will also cook directly in the pot a bit later. You’ll need something that’s not too shallow or not too deep, and definitely something that’s completely oven safe. 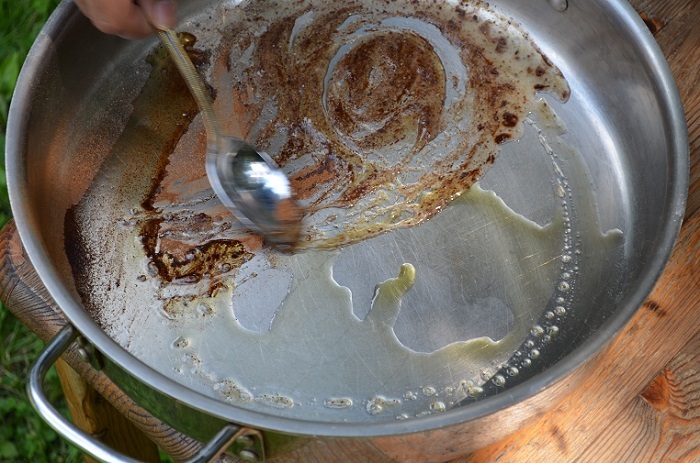 I use the stainless steel Calphalon pans because they can go right from stove top to stove. You could also use a large tagine for this dish, which would actually be quite perfect. Just add them to the pan directly and combine. 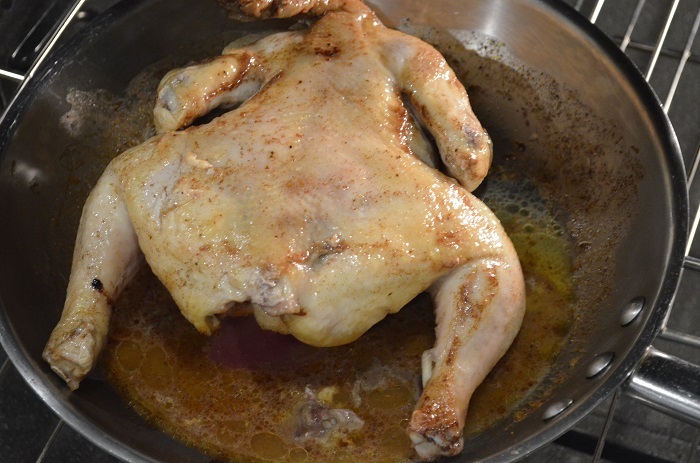 Rub a whole chicken (or a whole one cut up) around in the mixture (olive oil, honey, cinnamon and ginger, salt, pepper). Toss it around and be sure you get the whole thing covered up. Add about 1/8 cup of water to the pan, too. This will help prevent burning or drying up of any of the ingredients. The directions I’ve read all say to cook the chicken breast side down so that it stays moist and you can flip it later to brown it. 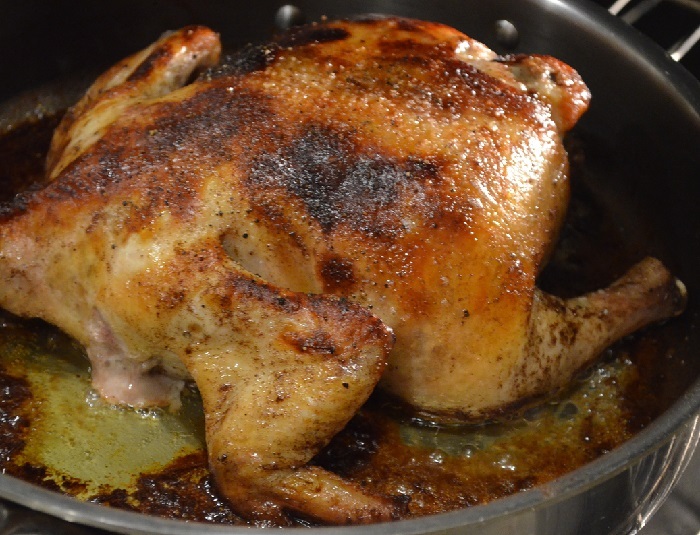 I know, chickens look so funny in the pan, don’t they? The problem I have with that is that the skin usually rips off and it doesn’t look presentable. What I do instead is cook it the whole time, breast side up, but I cover it during the last 40 minutes of cooking. 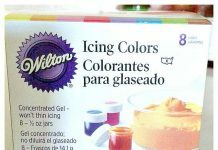 Comes out great- super moist and it’s nice and browned all over. I’ve done it both ways, which you might notice here. So, while the chicken is cooking, prepare the couscous by adding water and salt to it. Let it stand for about 5 minutes so it can thicken. I love how quickly and easily this happens! You can sort of tell it’s ready for more by fluffing it up with a fork. That’s when it’s ready to have the other ingredients added to it, before it goes into the pan with the chicken. And cinnamon, sugar, orange blossom water. And you can’t forget about the mixture of dried apricots, prunes (or raisins), and dates. The almonds, sautéd in butter, is probably my favorite part- it’s what truly adds all the flavor. 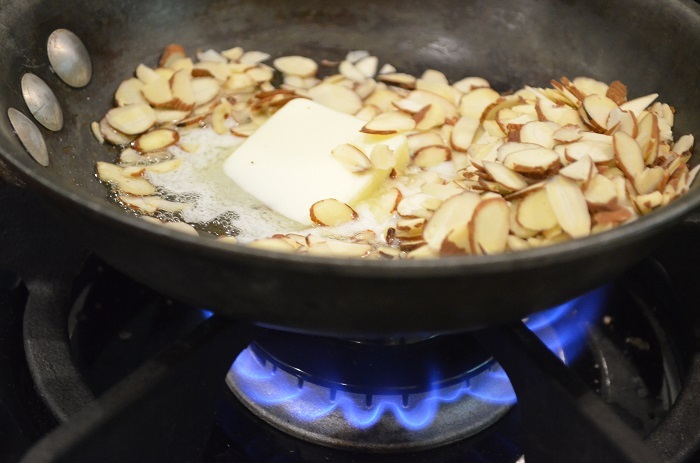 So, sauté the almonds in butter for about 2-3 minutes, watching carefully so they do not burn. 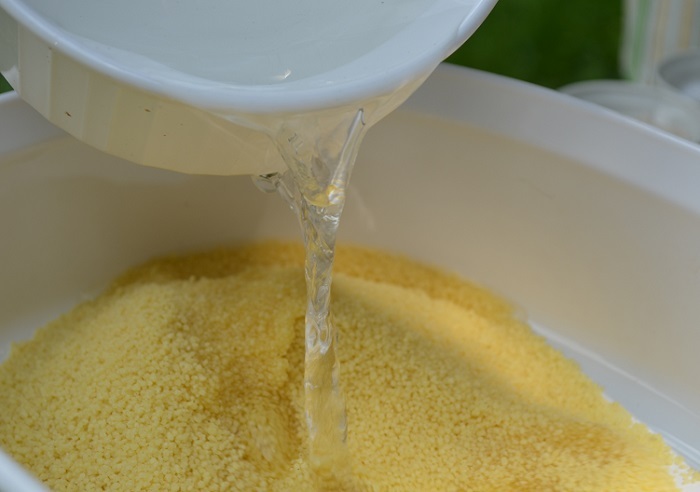 Pour onto the couscous mixture. 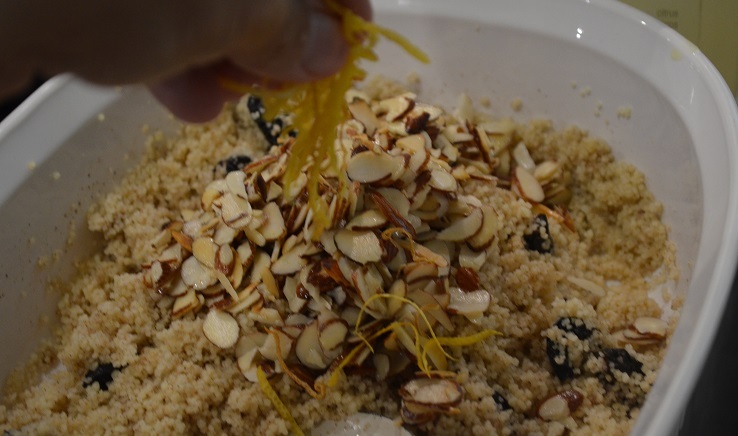 Add a little fresh or dried citrus zest, if you have it. I think it makes a difference. Leave this aside until the chicken cooks for a full 50 minutes. 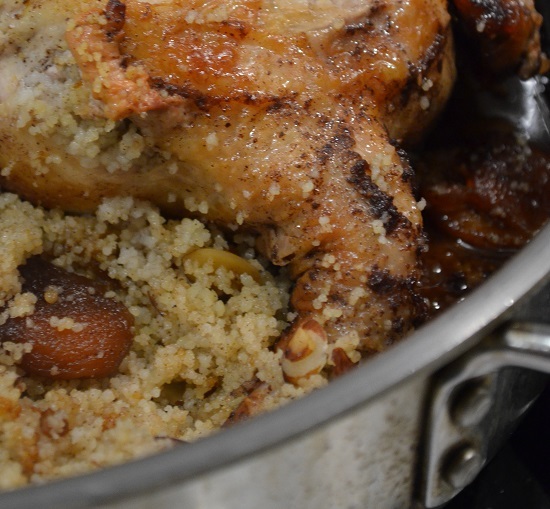 Flip the chicken (if you decide to be a flipper), and cook for an additional 10 minutes before adding the couscous. Now place the couscous in the pan around the chicken. 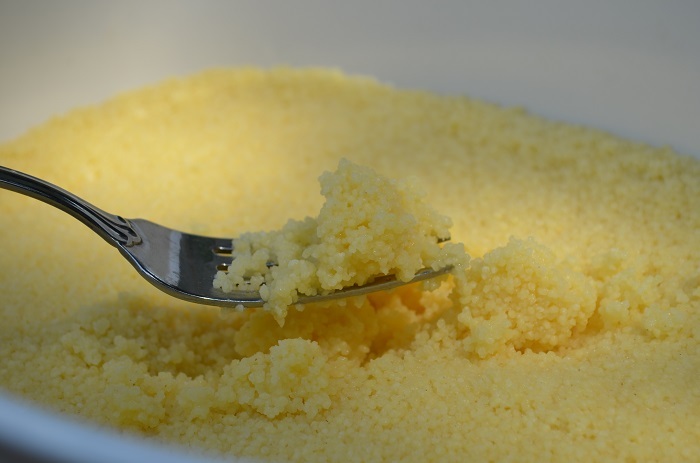 Add several pats of butter to the couscous. And cover with a lid or foil. Continue to cook for another 30 minutes at the same temperature. In this picture you can see what happened when I flipped the chicken, as the skin is coming off. Still good, still moist, though. Everything is so nice and browned. 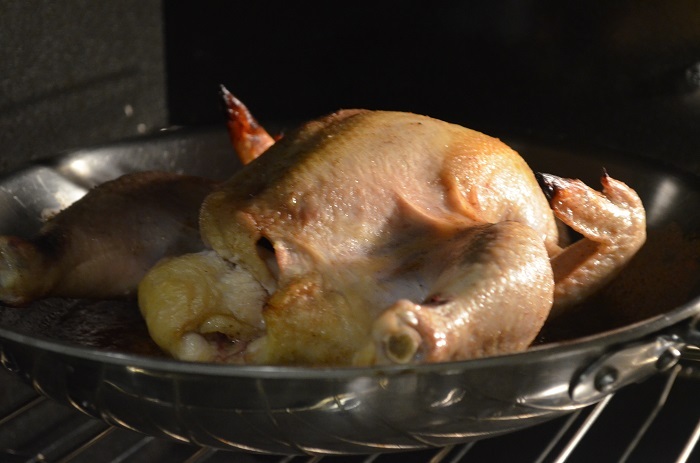 You can even cover the wing tips with foil if you don’t like them browning more than the rest of the chicken, or you can tuck them to the inside of the bird with bakers twine. Smelling this dish was an experience in and of itself. The cinnamon, the apricots, the citrus- they provided my kitchen with the most pleasant aroma it’s had in quite some time. You can serve directly in the pan, which is nice and rustic, however, if you decide to plate it nicely and neatly that’s great, too. It all comes out so softly. What, with all that butter? Do check out their products and use this recipe as an excuse! An aromatic mixture of sweet and savory North African ingredients makes this dish unique and delicious. 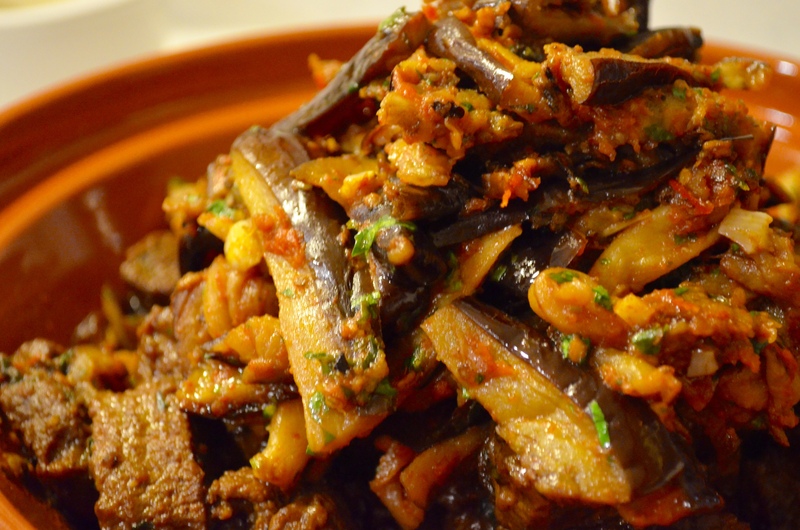 Substitute prunes or dried figs for fruits you may not have that are called for in this recipe. 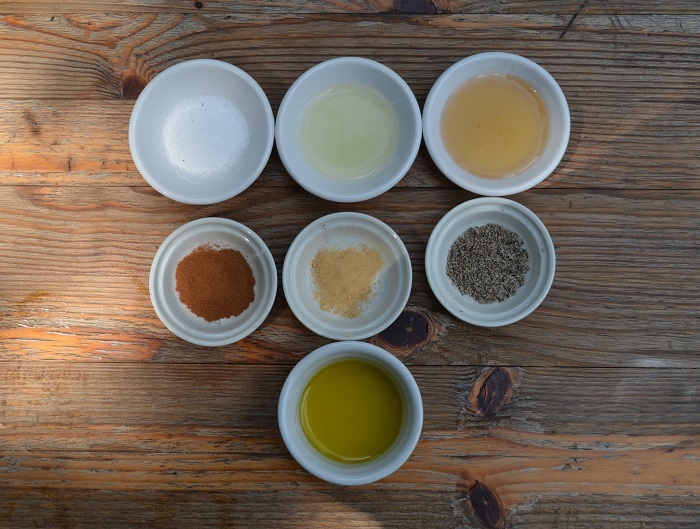 To an oven-safe dish or pan, add the olive oil, lemon juice, ground cinnamon and ginger, salt and pepper. Add the chicken and rub it around it the spice and oil mixture. To a large dish add the couscous, the water and salt. Let it sit for about five minutes. 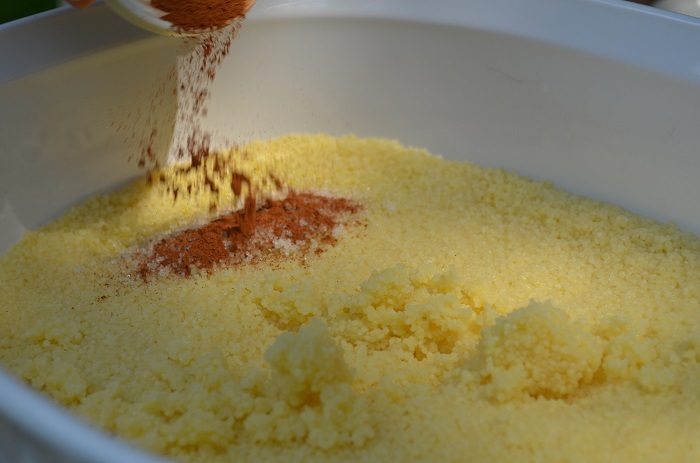 Once the couscous has fluffed up, add the remaining ingredients (sugar, olive oil, ground cinnamon and orange blossom water). Flip the chicken, if desired. If not, let it cook for an additional 10 minutes.Add the couscous mixture all around the chicken. 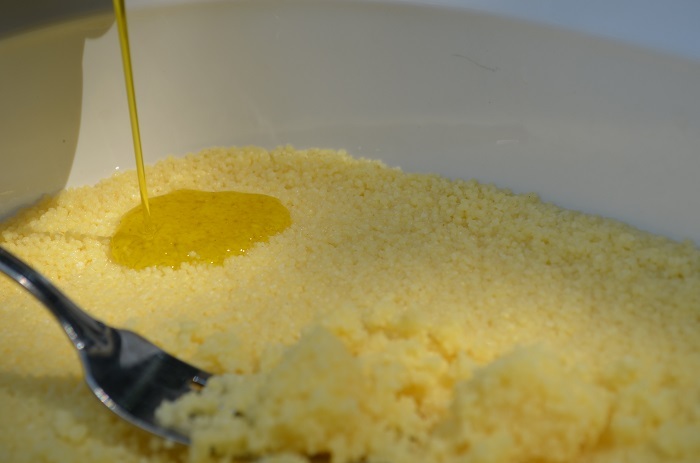 Add a few pats of butter on top of the couscous. Cover with a lid or foil and return back to the oven for 30 minutes. Looks good! 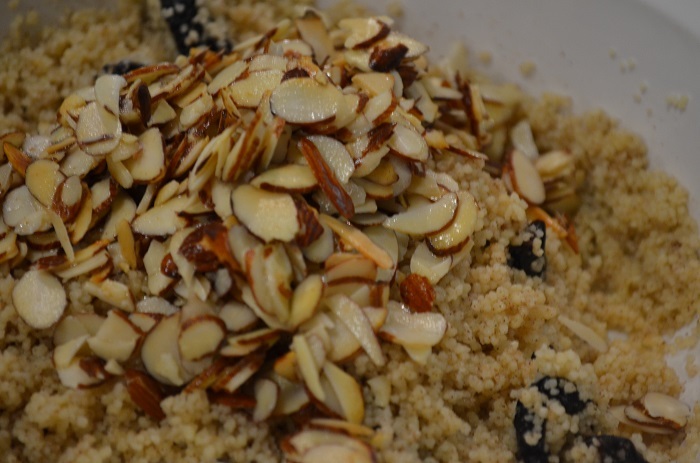 Can I substitute rice for couscous and follow the same recipe? Or using the rice will require some modification? Wa’alaikum as salaam Hina- the rice would need to be par-boiled at least, and depending on the variety I really couldn’t say for how long but that would be a nice option, too! Thanks Yvonne!! Always love & enjoy your recepies. Made this recipe after reading about a similar one on NYTimes… this recipe was perfect!! subbed orange extract for the blossom water, cooked it breast up. 5lb bird took about 1.5 hours and turned out excellent. Even with all the food, there were no leftovers in my family of 4. So good to hear- thank you for coming back to let us know! I want to make this recipe but with pigeons instead of chicken. Could you send info on this as a recipe for pigeon please? It just depends on their size but you’ll have to only adjust cooking time/temp and possibly some spices, if you prefer. 1. Do you think this would work well with cornish hens? 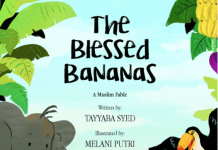 Just to make it more Ramadan friendly for guests. 2. 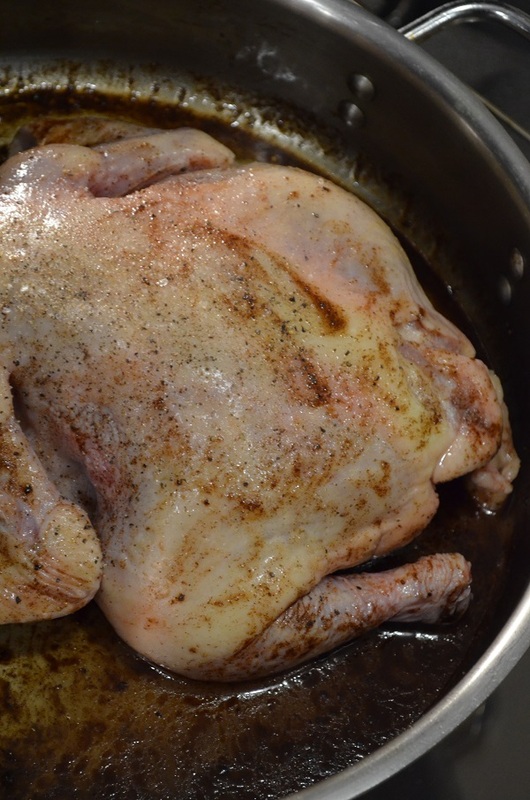 When cooking the chicken initially, did you cover with foil? Thanks in advance! Ramadan Kareem to you and your family! Yes, I think it would work really well with cornish hens. 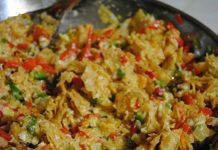 I just find them difficult to find dhabiha halal which is why I didn’t include them in the recipe but they are a favorite in something like this! And yes, you can cover with foil that would be good- just be sure to remove the foil at the end for about 10-15 minutes to let the bird get a little crispy on the outside. I found this originally on the NYTimes cooking website and wanted to check it out here–absolutely delicious! My whole family loved it! I look forward to reading your other recipes. 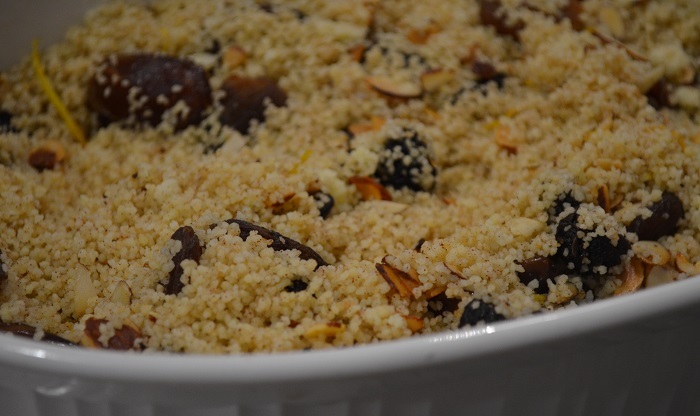 Can the couscous be substituted with quinoa(for gluten-free), which changes would have to be made? Will also be using 4 pounds of chicken legs and thighs. Thanks! Looking forward to trying! Yes, but you would have to follow the instructions for the quinoa.